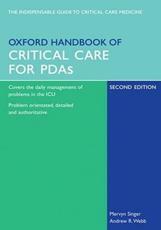 The Oxford Handbook of Critical Care for PDAs enables enhanced, multi-layered access to the entire text, illustrations and tables. Fast access is available via the table of contents, index and full-text search, and there is a facility for book-marking and annotating the text. It is suitable for most Palm, Windows CE and Pocket PC devices. The Oxford Handbook of Critical Care provides a perfect reference source for consultants, junior doctors, nurses and paramedical staff describing best practice in a succinct, concise, clinically orientated way. It covers therapeutic and monitoring devices, drugs and fluids, specific organ system disorders and complications, and general management philosophies and material on areas such as adjusting the ventilator; managing ARDS; haemodynamic monitoring stroke; the control, diagnosis and treatment of infection; sepsis and septic shock, and withdrawal and withholding treatment. Patient centred and practical with up-to-date key references, it continues to be the first port of call for anyone caring for critically ill patients. System Requirements: Palm OS 3.5 or higher: 4.1 MB Windows Mobile 5/Pocket PC 2002/2003/ Windows Mobile 2003: 3.8 MB Macintosh OS 7-OS X with 8 MB of free hard disk space PC running Windows 95/98/NT/ME/2000/XP with 24 MB of free hard disk space Technical information: To use this product you need: PC Pocket PC Phone Edition device running Microsoft Windows Mobile 2003, Windows CE/PocketPC or Palm OS. It comes as a CD which is uploaded to a PDA via a PC. As part of the upload process, users will need to visit the website of our development partner Skyscape to access the password which will enable use of the product. Full instructions are provided.